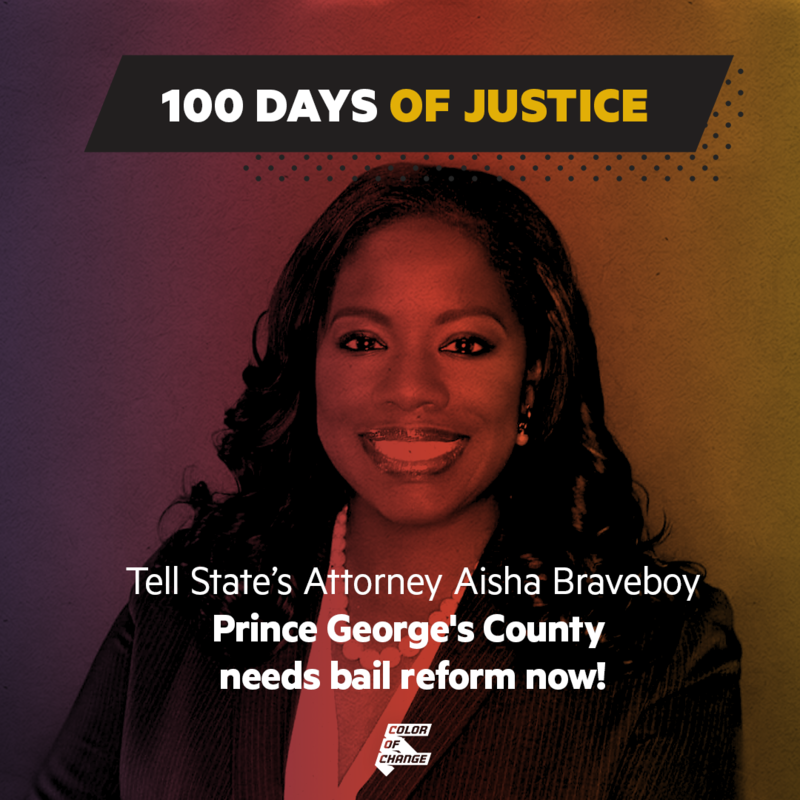 Tell State's Attorney Aisha Braveboy: Prince George's County needs bail reform now! Prince George's County has a jail problem. Black people make up about 65% of the population of Prince George’s County but are more than 80% of the people awaiting trial simply because they lack the resources to post bail. This system of money is creating unimaginable hardship in Black communities everywhere. We have witnessed Black people falling into debt, losing their jobs, getting evicted from homes and being ripped apart from their families. Not only is serving time simply because of an inability to pay unconstitutional -- it is inhumane. Two years ago, the Maryland Court of Appeals agreed and ruled money bail as unconstitutional, but real bail reform has yet to be implemented. The monumental court decision instructed judges to use cash bail as an absolute last resort and to consider non-financial alternatives to money bail. However, to get around the fact that they can no longer set high bails, judges and prosecutors are just locking people in cages with no way out at all through "no bail" requests. As a result, Black people are being held indefinitely, completely undermining the intent of the Maryland Court ruling. Maryland officials took an important step in recognizing the problems with cash bail, but they need to go much further if it is actually going to keep people out of jail. State's Attorney Aisha Braveboy can end this discriminatory practice by taking concrete steps to ensure bail reform becomes a reality. Advocate for the defense attorney to have more time with his or her client prior to the hearing. We ask that you use your immense power as State’s Attorney to reject a system that keeps people in jail because they cannot afford to pay their bail amounts, while those with the financial means are allowed to be free.